At once familiar and slightly bizarre, Ann Toebbe’s meticulous collages belong to the stay-at-home intimist tradition that begins with Édouard Vuillard’s Parisian interiors. For several years she has cut up bits of colored paper to recreate — with help from photographs and memory — the domestic interiors of her life and of the people around her. For her solo debut at this gallery in 2013, she recreated her childhood bedroom, and rooms inhabited by relatives and neighbors she knew growing up in Cincinnati. “Second Wife,” a 2014 Ann Toebbe collage using gouache and cut paper, is at the Monya Rowe Gallery. Now Ms. Toebbe’s focus has shifted to adulthood and the homes created or dispersed as she and those around her marry or divorce and remarry. 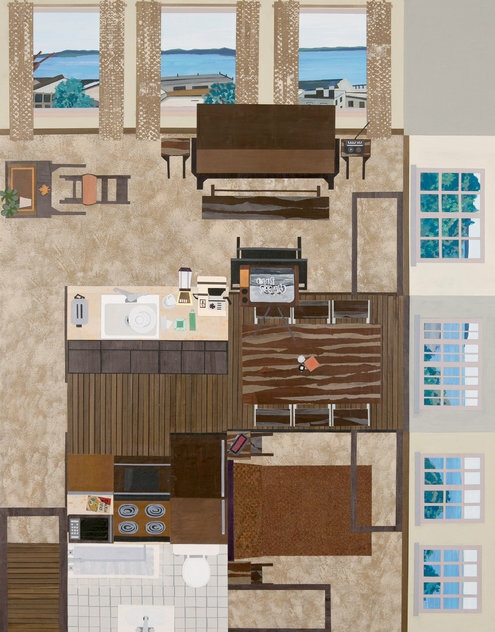 Thus she depicts the places she and her husband have lived, but also his home during his first marriage as well as the current home of his first wife, now in her second marriage. The successive homes of her husband’s parents, when they were married and after they divorced and married others, receive similar treatment. A weird architectural family tree unfolds. As with her previous efforts, both craft and details boggle the mind. So does trying to decipher everything, since each space is depicted from five orientations — that is, from above with each wall in elevation, like a pop-up dollhouse. Which way’s up? Spatial tensions become entwined with emotional histories that we can only imagine but that are invariably told from conflicting perspectives. Ms. Toebbe’s interest in the home front is shared with contemporary painters like Sarah McEneaney and Jonas Wood, as well as the outsider genius James Castle. It is a subject that never stops giving.